I believe this is going to be a drawn-out wildflower season in the Potomac Gorge. In the past few years, I’ve observed that once the flowers start blooming, they bloom fast. The result is a spectacular mass of flowers all open at the same time, but then it ends quickly, too. This year seems to be different, and I’m guessing it’s because of some early warm weather followed by many days of cool weather. I had a quick look ’round some favorite spots yesterday, and noticed that almost everything had closed up due to the overcast. A few more twinleaf had opened, but only a few. Slow is not a bad thing. It means more time to find and photograph some favorites. 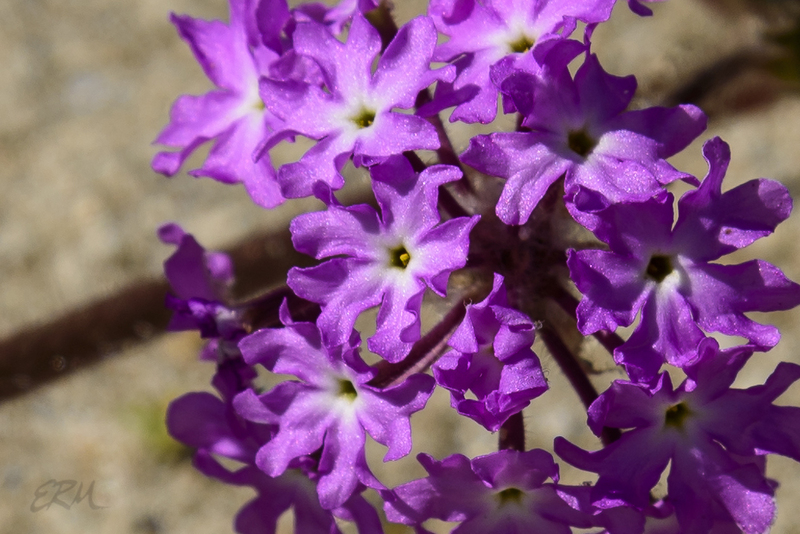 There are so many interesting plants in the desert, and not just forbs. In mid March when I was at Anza-Borrego, shrubs were in full bloom, too, and one really unusual tree-like plant was just starting. And then there were the palms. This shrub goes by the common names brittlebush, incienso, and gold hills. I saw them all over the place, standing like good omens, saying “welcome to Anza-Borrego!” with their cheery yellow flowers. 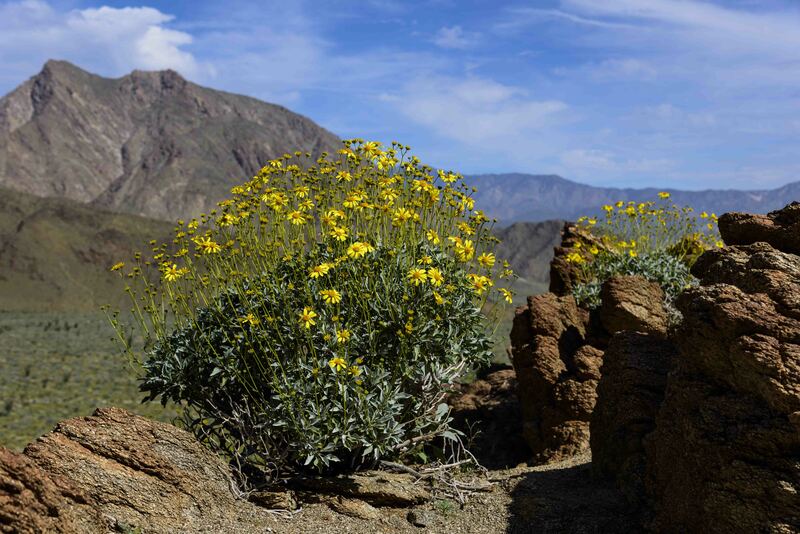 Brittlebush is in the Asteraceae, of course, and can be found on hillsides and slopes in the Sonoran and Mojave deserts, at elevations from below sea level to 3,000 feet above or more, depending on which authority you consult. 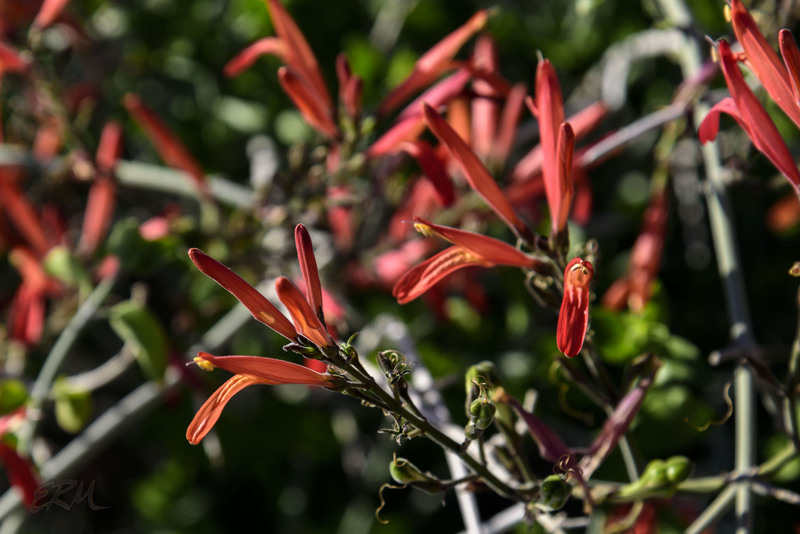 Known commonly as beloperone, chuparosa, and hummingbird bush, this species is found mostly in the Sonoran Desert, with a few occurrences in the Mojave. It can grow to six feet tall and twelve feet wide. Justicia, a genus in the Acanthaceae, has over 600 species, only a few of which are found in North America. Of those, the most widespread is Justicia americana, which ranges from Texas to Quebec; there are vast stands of it in the Potomac River every summer. Ocotillo is such an unusual plant, it deserves a post all its own, but I’m short on time. Each stem can grow to 20′ tall, and a mature plant can have dozens of stems. They bear leaves only after sufficient rain. The bright red flowers attract hummingbirds. From a distance you might think they’re a type of cactus, but they aren’t even closely related. 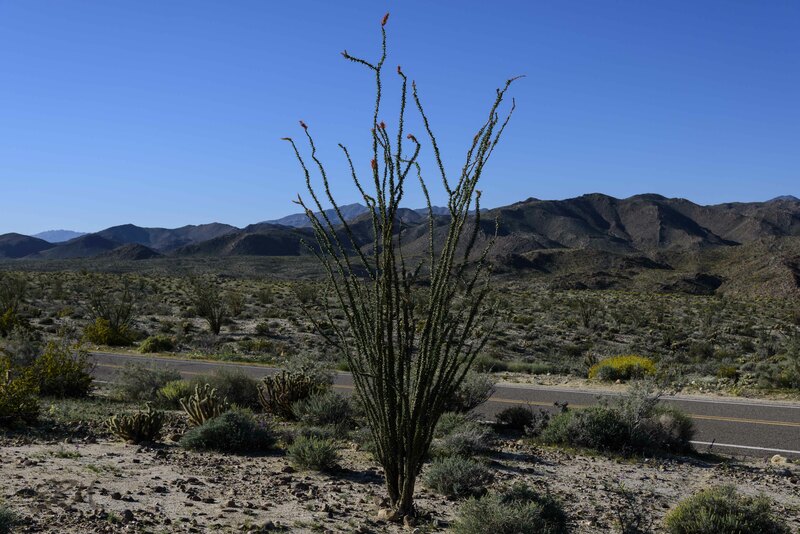 (Going up on the taxonomic tree, cacti are in the order Caryophyllales, while ocotillo is in the Ericales.) There are only eleven species in the genus Fouquieria, which is the only genus in the family Fouquieriaceae. 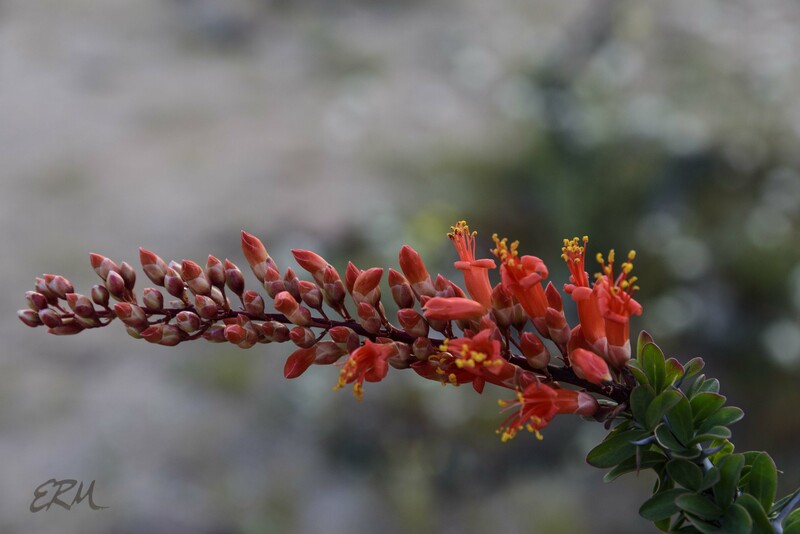 Ocotillo grows on slopes and hillsides, ranging from the southern Mojave through the Sonoran and Chihuahuan deserts. 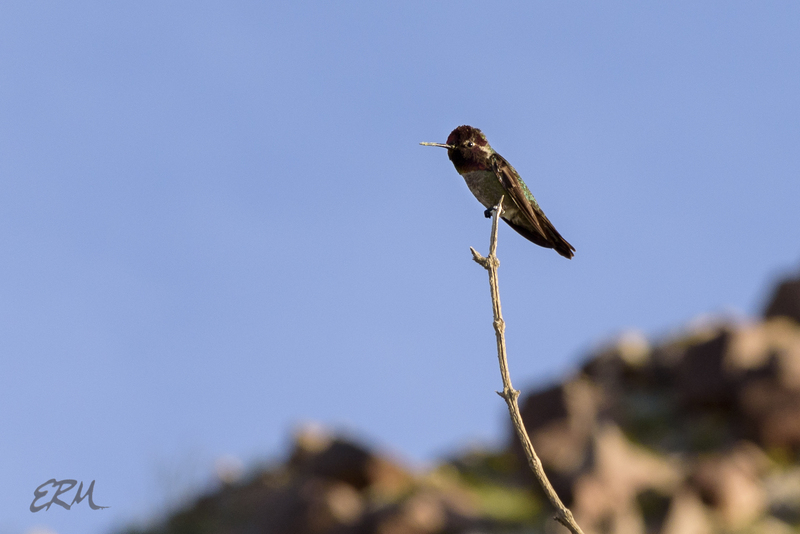 That’s a black-chinned hummingbird, Archilochus alexandri. Once more I was both thankful to have a zoom lens, and wishing I had a longer zoom lens. 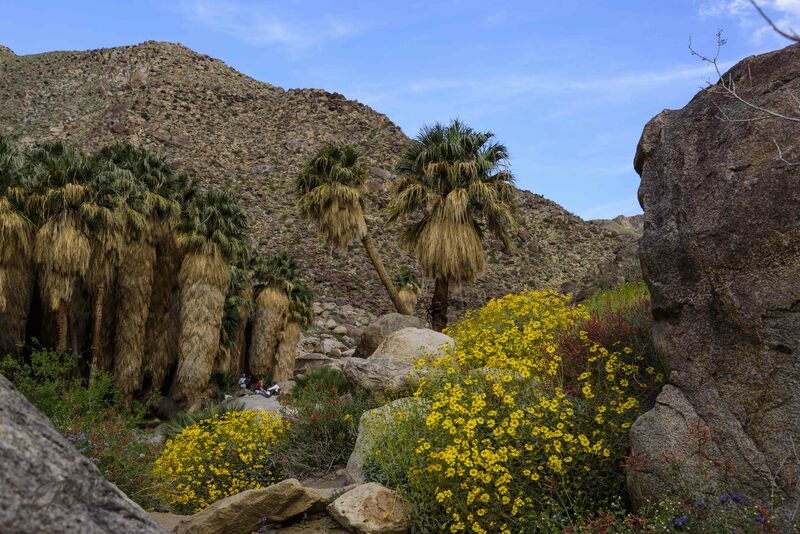 One of the greatest wildflower displays in Anza-Borrego was along the Borrego Palm Canyon trail, a nice, easy hike up a gentle grade that leads to actual running water and a big group of Washingtonia filifera, California fan palm. This plant in the Arecaceae can reach heights of 60 feet in the presence of open water. 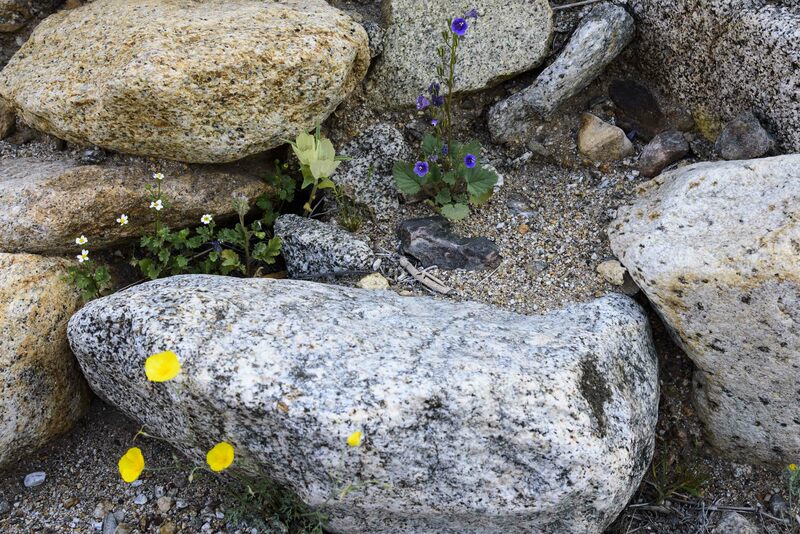 Click on the picture to see it larger; note the people on the boulder for scale, and how the brittlebush and chuparosa are growing together. 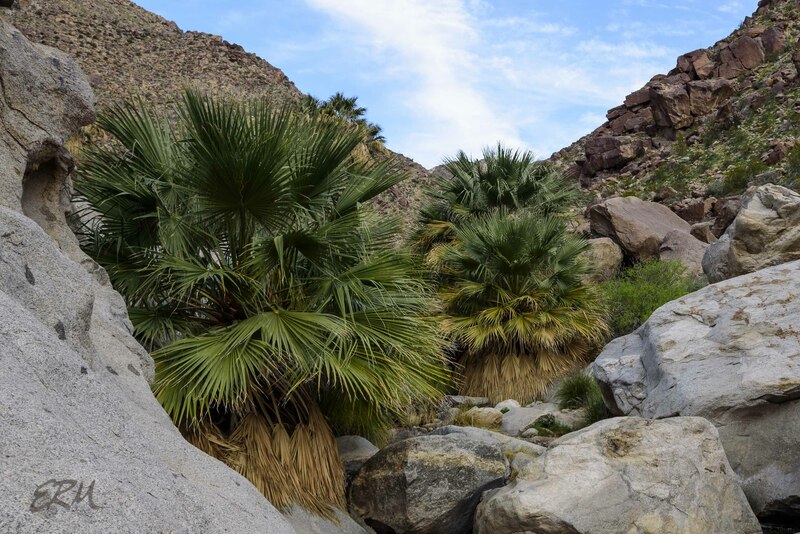 California fan palm is native to the Sonoran and Mojave deserts, and is the only palm native to western North America. 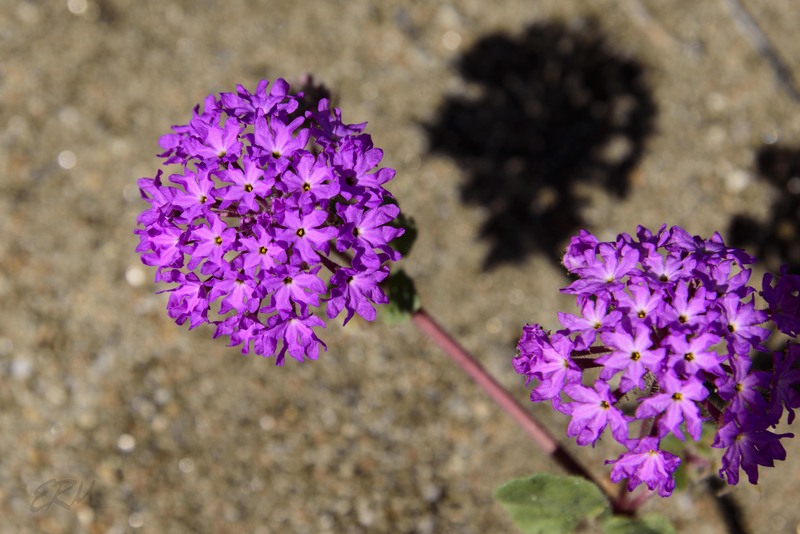 So if the five petals of a desert sand verbena flower (see previous post) are not really petals, what are they? In order to answer that, I’ll need to review some basic flower terminology. The reproductive organs of a flower (the pistil and stamens) are usually surrounded by petals, which are modified leaves, often brightly colored. Collectively, the petals form an inner whorl of parts that is called the corolla. There is usually an outer whorl, too. This consists of sepals, modified leaves that are often, but not always, green, and surround the flower bud as it forms. Collectively, the sepals are known as the calyx. Taken together, the calyx and corolla are called the perianth. In some species, there’s another set of modified leaves at the base of the flower, in addition to the calyx and corolla, that are called bracts. The bright “petals” of poinsettias and flowering dogwood are examples. 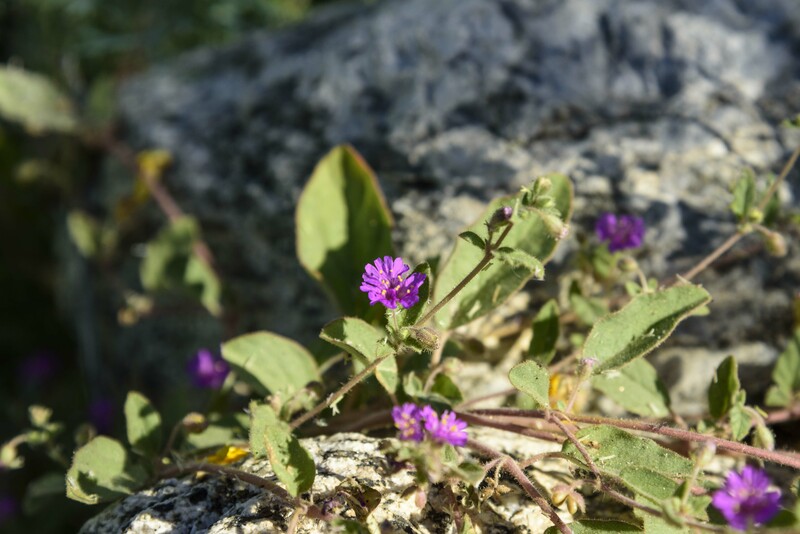 Detailed, technical descriptions of flowers in the Nyctaginaceae will mention the perianth, but say nothing of the petals, because there are none. What looks like five petals on the sand verbena flower is actually a single five-lobed tube formed by five fused sepals. This is typical for flowers in the Nyctaginaceae. Some sources state that the perianth comprises fused tepals; think of a tepal as an intermediate between a petal and a sepal. Flowers in this family often have bracts as well; Bougainvillea is an example. The reproductive parts usually consist of a single pistil and five stamens. The inflorescence is typically a cyme. 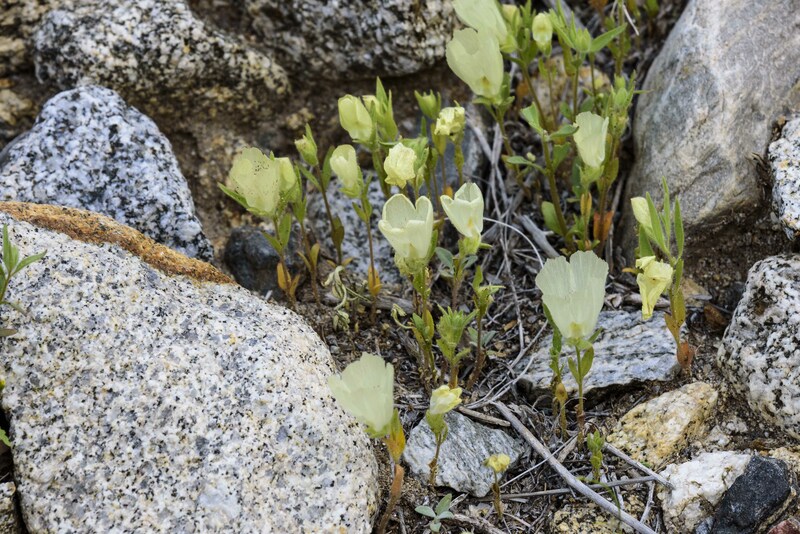 Most species are forbs, though there are a few shrubs, trees, and vines. There are about 300 species in about 30 families, found mostly in tropical and warmer temperate regions of the world. 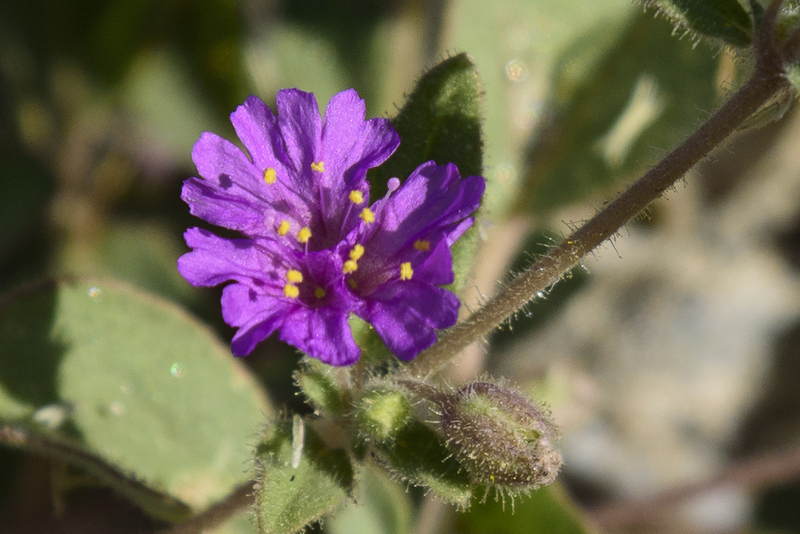 Several species of plants from the Nyctaginaceae are found in the Sonoran Desert, including the following. Trailing windmills is a forb with a vine-like habit, growing along the ground. It can be either annual or perennial. The species is found in the Chihuahuan, Sonoran, and Mojave deserts, and the southern part of the Great Basin Desert. There are two varieties, incarnata and villosa. I believe this one to be the later based on location reports in CalFlora and the USDA PLANTS Database. I don’t have sufficient detail to identify it based on plant characteristics. This flower consists of three clustered perianths. Unlike most other species in the Nyctaginaceae, trailing windmill flowers stay open all day. Most species in this family have flowers that open late in the day, hence “four o’clock”. Depending on which authority you consult, there are four to six varieties of this small shrub, commonly called wishbone bush or wishbone plant. I believe this one to be retrorsa, but lack sufficient detail to say for sure; it could also be villosa. Both have similar ranges in the Sonoran, Mojave, and Great Basin deserts. 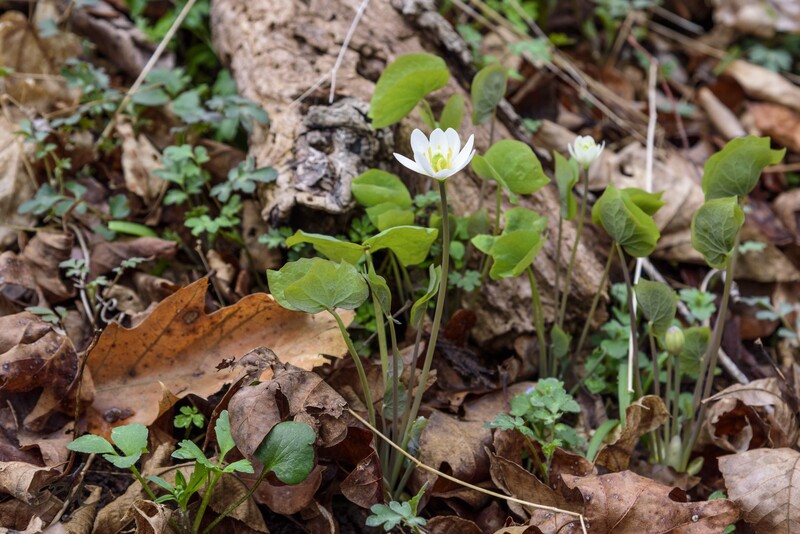 No plant in the piedmont that I know of has as short a bloom time as twinleaf (Jeffersonia diphylla). 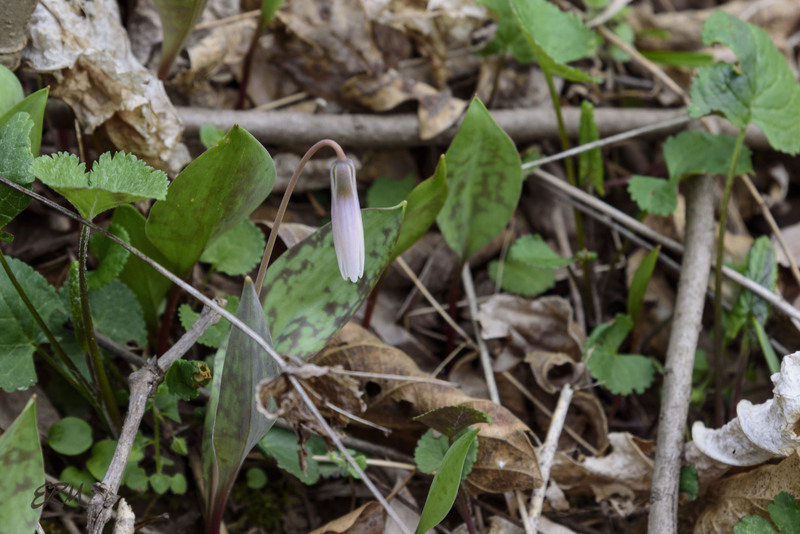 Thanks to a tip from a fellow hunter, I was able to get out to Billy Goat B today, where I saw just two of them blooming. If they follow the same pattern as in recent years, they will be in full bloom in another two days, maybe, and done by Sunday. I’ll write about twinleaf and post more pictures later, but I wanted to get the word out before it’s too late. 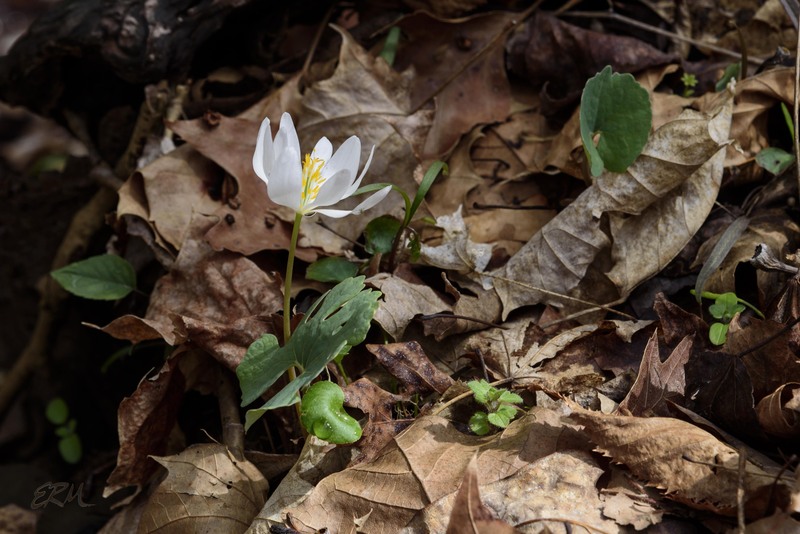 Also seen blooming today on Billy Goat B and in the Carderock area: trout lily, Dutchman’s breeches, leatherwood, Virginia bluebells, cut-leaf toothwort, slender toothwort, early saxifrage, round-lobed hepatica, rue anemone, toadshade, and bloodroot. 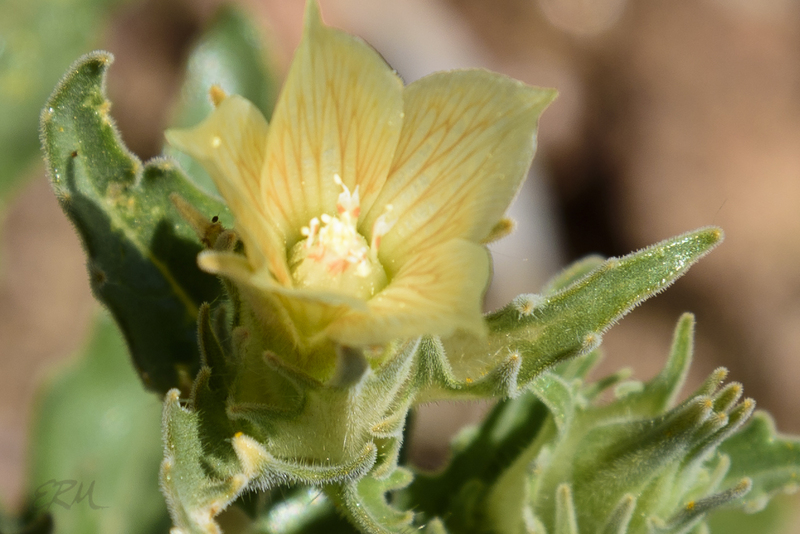 The Sonoran Desert’s wildflowers range from belly-flower sized to big and showy. 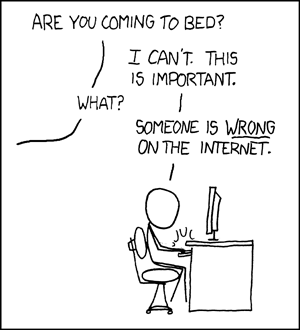 Here are two of the latter. Although honestly, I took a lot of belly shots anyway. It was a sandy belly, sandy elbows kind of week. 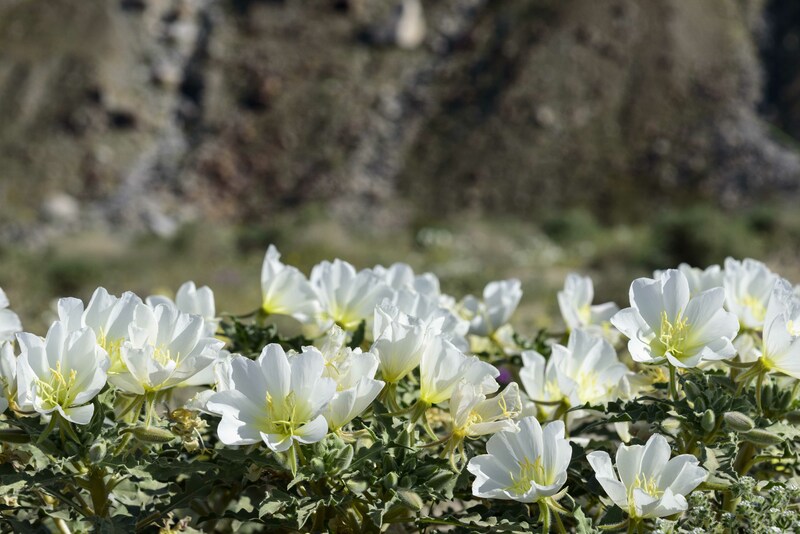 There’s a native Oenothera species for every state in the Union except Alaska. Dune evening primrose is more widespread than many of them, and more widespread than many of the species I found in Anza-Borrego; it ranges from the Chihuahuan Desert north through the Sonoran and Mojave Deserts to the Great Basin Desert in Oregon, and also somewhat inland and along the California coast. 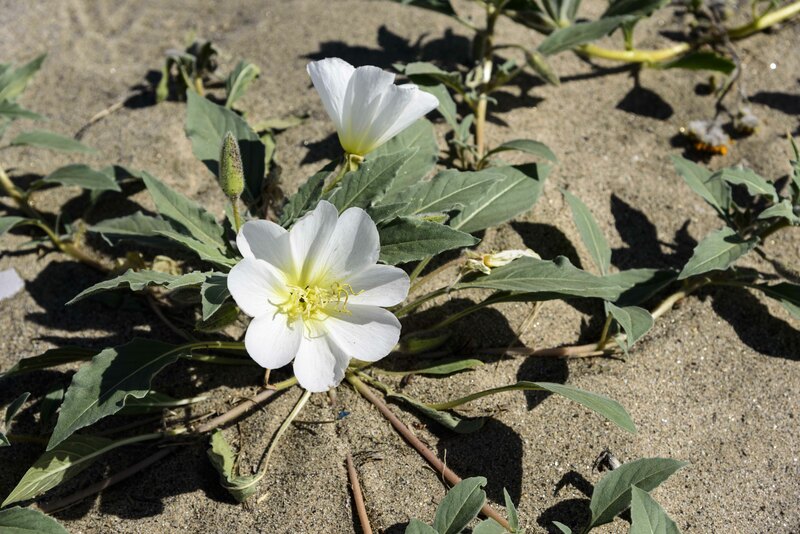 The plants I saw spread out along the sand maybe as much as three feet, and stood up to about a foot tall. 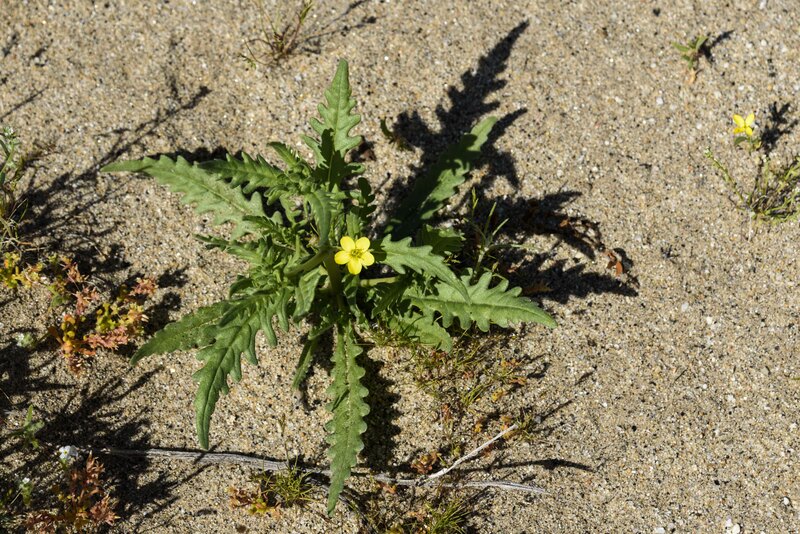 I’ve read that in other parts of its range desert evening primrose can stand up to three feet tall. It’s described by various sources as both an annual and a perennial, so I’m not sure what to conclude there. One thing’s for sure, in Anza-Borrego at least it grows in association with this next plant. Almost any time I saw one, the other was there, too. Or close by. 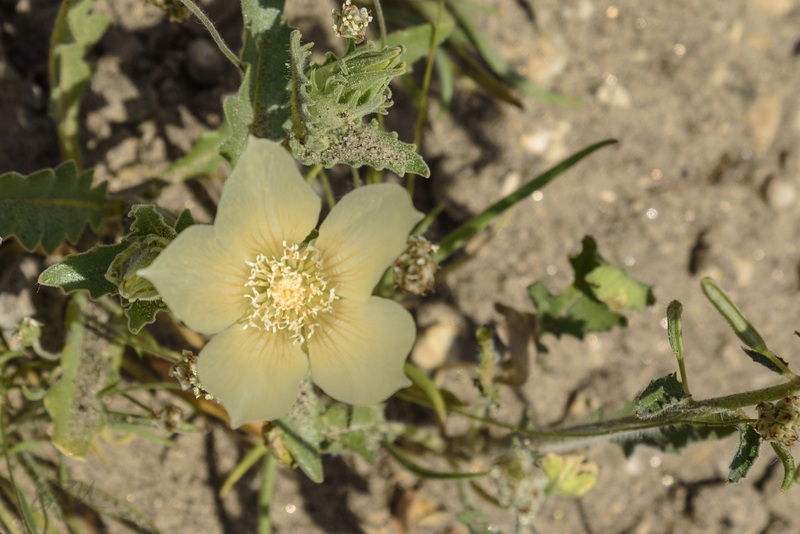 Desert sand verbenas are not actually verbenas, which are in their own family. It’s in the four o’clock family (Nyctaginaceae). 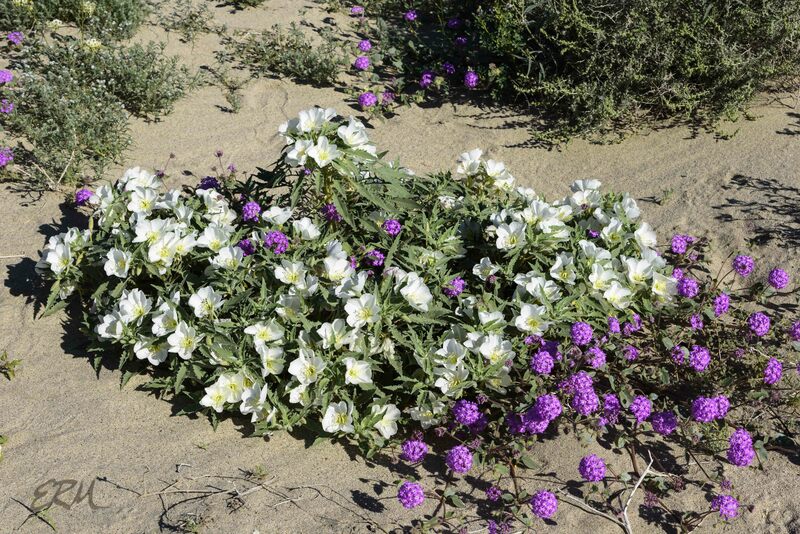 It is similar in size and growth habit to the dune evening primrose, but with a smaller range, being mostly restricted to the Sonoran and Mojave deserts, and some inland and coastal areas in California. Take a look at the flowers. Looks like each has five petals, right? Not really. Another botanical oddity. 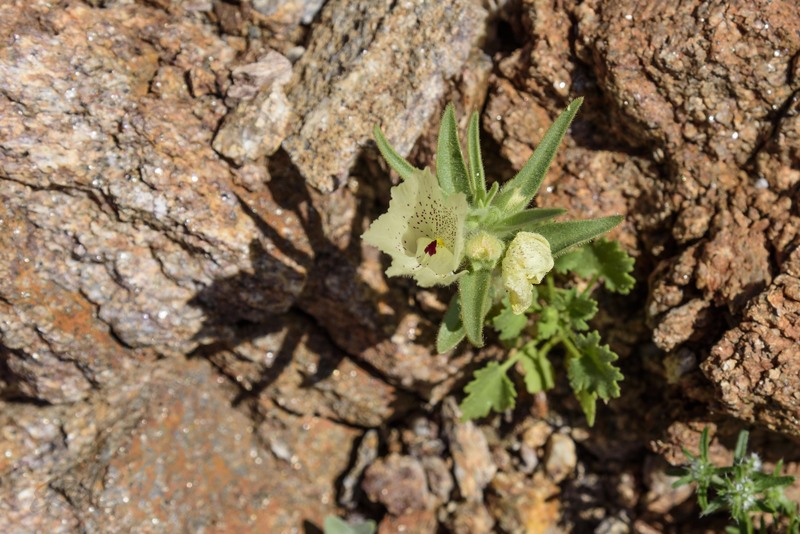 More on that and other desert plants in the Nyctaginaceae next time. 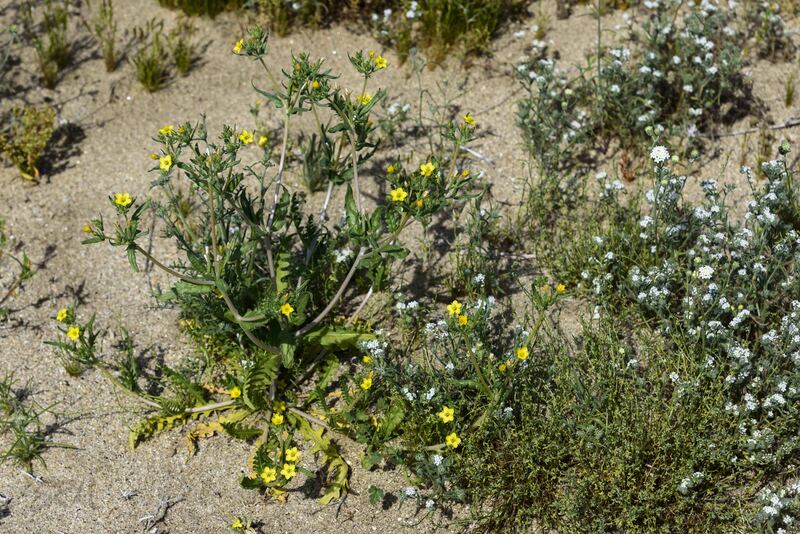 There are at least six different species shown flowering in the first photo, and one plant not flowering but clearly a seventh species (not counting the dead ocotillo). Click on it to see it larger. 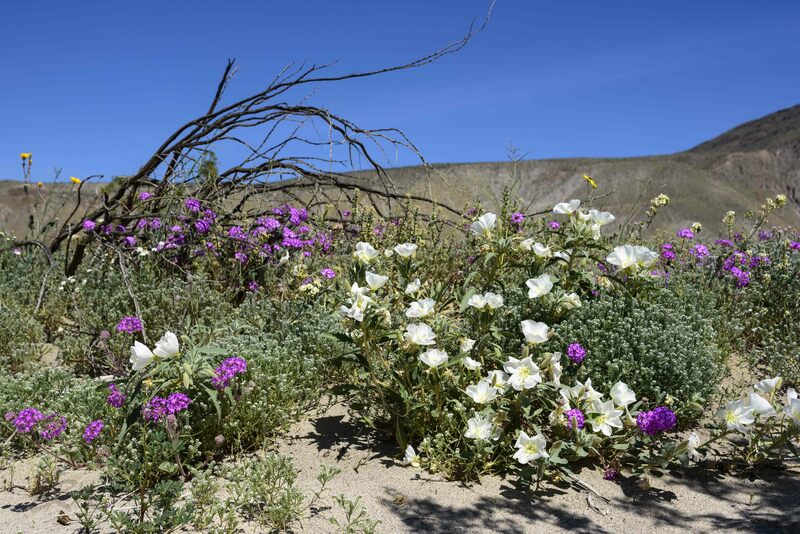 This was one of the neat things about the super-bloom: so many different species growing together, forming crazy bouquets. So I immediately went back to the computer and corrected every instance where I’d typed “Mohave” instead of “Mojave”. I hate making mistakes like that. I work hard not to make mistakes like that. Why did I make a mistake like that? I blame this flower: Mohavea confertiflora. Ever since identifying it and adding it to my spreadsheet, I’ve been mixing up the words and typing them wrong. Ghost flower is an annual that grows to about ten inches tall, bearing single flowers in the leaf axils, and is easily identified by the red spots inside the petals. 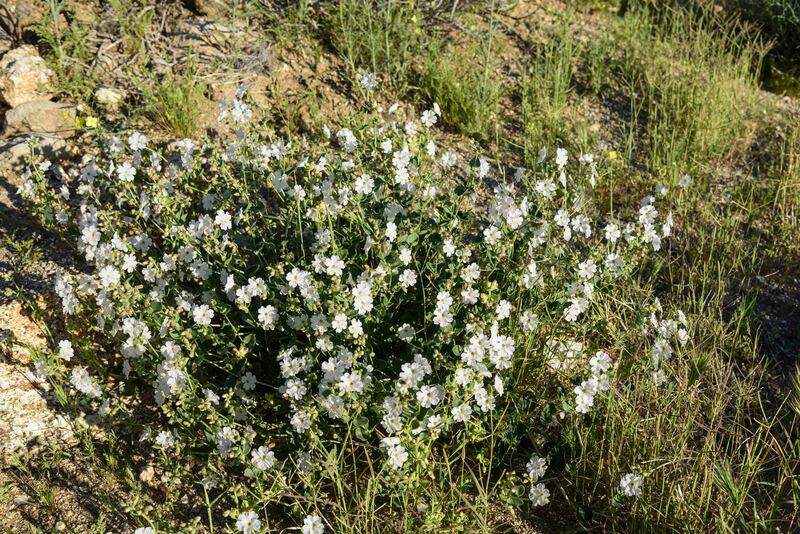 It can be found on washes and gravelly slopes in both the Sonoran and Mojave desserts. 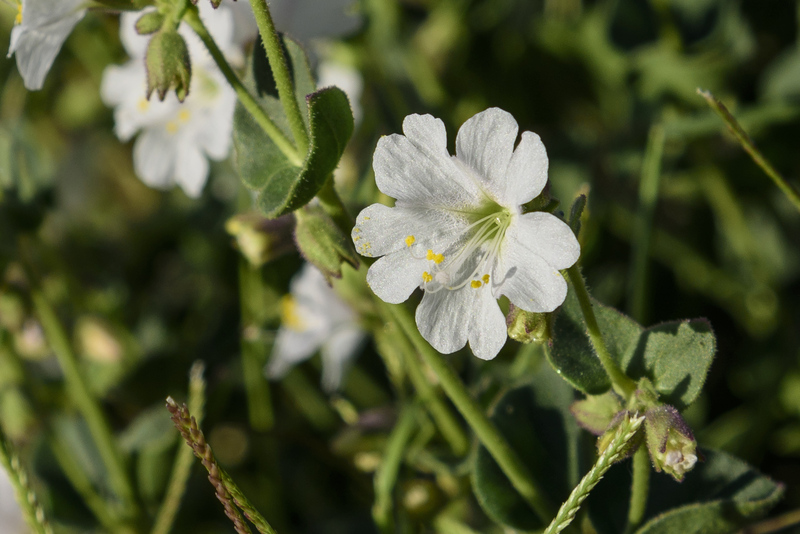 Its cousin Mohavea breviflora is found in the Mojave and Great Basin deserts. In other news of genera starting with M, I found several species of Mentzelia. More on them next time. In case you’re wondering, the lead photo shows ghost flower, rock daisy, gold poppy, and two different species of phacelia.